The industry has always depended on ideas expressed on paper to mark styles and trends for colors, cuts, and textures. In this way, the illustration has also evolved digitally to give creatives more precise tools that allow them to capture the intention of the designer in each sketch. 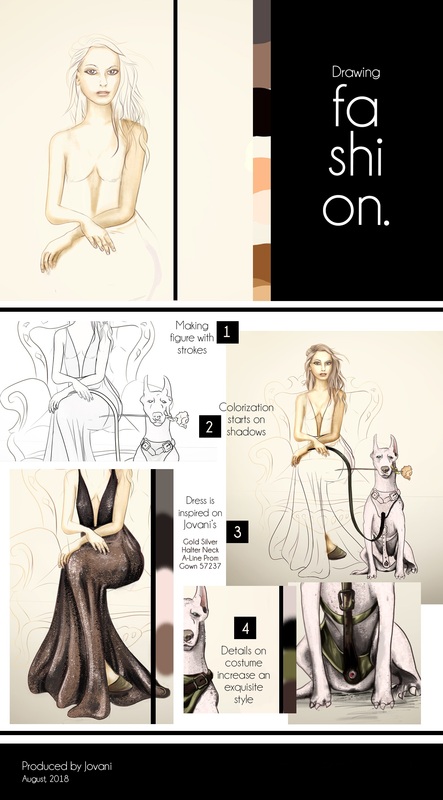 When approaching fashion illustration, the predominance of traditional techniques such as pencil finishes with soft lines, curves and free to focus the human silhouette is maintained, with a tendency to stylize the human body to give it a more stiff appearance that helps to convey visually the glamor and utopian beauty about which a dress or designer garment is usually conceived. Each illustration is considered from the style of garments designed by the brand that will be worked on. An editorial illustration usually maintains certain minimalism in its composition to keep the attention on its protagonist: the dress, and so each element that accompanies it will have for almost sole purpose to enhance its charm. From a sketch on paper, the use of ink or the implementation of a graphic tablet; always the body will be the first to be defined. The pose often establishes the personality of a person, so it will deserve particular attention to be drawn to make it attractive and natural, and then on this shape the appearance that the garment would have to be put on. Paying attention to the position, lights, and shadows that merge with it will generate a vivid and realistic appearance, enough to differentiate from any other garment (which often distinguishes one designer from another). Once achieved an appearance close to the desired final result, composed only of strokes, the colorization will be done through photoshop brushes (in the case of digital illustrations as the reference image), defining a global color palette or for each element according to is preferred, to give harmony to the image. The use of brushes will be for each designer the extra touch that his experience and meticulousness will have provided him during previous works because the finished ones will depend solely on his creativity and on the idea that he wants to capture together. Whether as a piece in the development of new designs that each firm promises to its audience each season or as a plus to highlight the details that will make your brand unique, digital illustration is a weapon that will not go out of fashion for now.